Kitchen tools are everyday objects that can be mundane or special. Here is a beautiful knife made my UK blacksmith and toolmaker Dan Prendergast. Dan makes his knives entirely by himself. He forges, grinds, glazes, heat treats, sharpens each knife himself. Each knife is made entirely from high carbon steel and sustainably managed hardwoods. Dan’s knifes offers superior function, solid craftsmanship and a simple, rustic aesthetic. This knife can become an everyday kitchen tool that you will enjoy for years to come. Ever since I discovered Dan’s knife in my brother-in-law’s kitchen in Burlington VT, I have wanted one for myself. The knife’s raw beauty attracted me and it cuts, slices, and chops easily. It feels like slicing through butter. I went on the website and read about his work and felt admiration for his approach to making tools. I bought myself one for my 40th birthday. The buying experience was personal. You write to him via his contact page, he replies, there is a brief discussion about the knife size and color handle you want, he makes your knife to order, and when it is finished he ships you your custom made impeccable knife in the mail. In the exchange, he even reminded me a few times how to care for my knife, making it very clear that he cares about the objects he sends into the world. He wants you to take good care of your knife so it lasts and stays in good condition. I use Dan’s knife everyday in my kitchen and it makes my cooking experience easier and more enjoyable. A good knife really does make a difference. 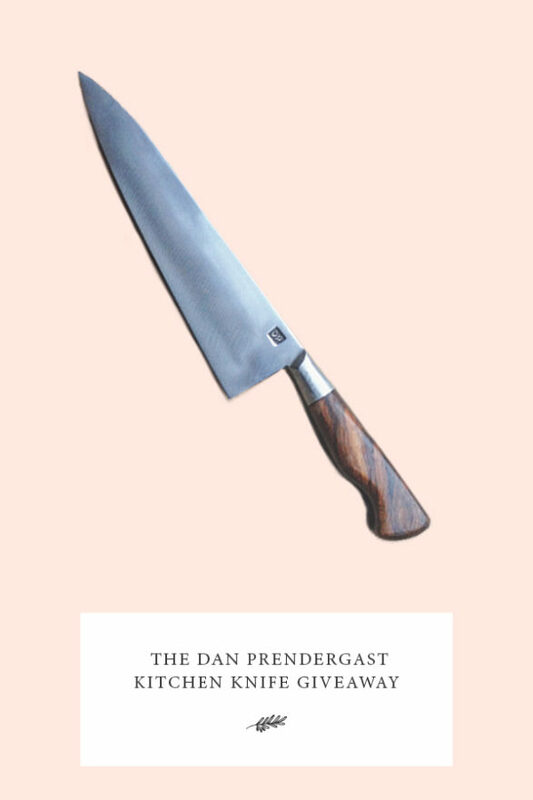 Today, Dan is giving one lucky reader a knife. To enter, leave a comment below and sign up to for Jewish Food Hero email newsletter right here (if you are not already on the list). A winner will be chosen at random on Tuesday December 26th, 2017. Good luck! Update: A winner has been chosen and notified. Thanks for participating! If you are interested in offering a giveaway of your purposeful product, service or experience on Jewish Food Hero, start a conversation with me here. Thank you for supporting the brands that support Jewish Food Hero. Previous What’s On Your Hanukkah Playlist, Shifra C. Penkower?